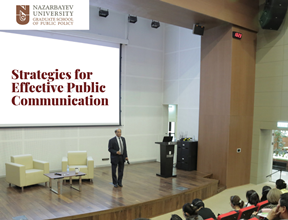 Basskaran Nair, currently Visiting Professor at the Graduate School of Public Policy, Nazarbayev University and author of the book “Marketing Public Policy”, which was published in 2018 by Routledge, held the lecture on “Strategies for Effective Public Communication” on on 29 March in Nazarbayev University, Nur-Sultan for the representatives of the ministries, Akimat, Mazhilis, Academy of Public Administration, Academy of Law Enforcement Agencies, UNDP, NU students and Akimat of Almaty on 5 April. In his presentation, Basskaran Nair pointed out that Singapore is not the result of natural process. It is the result of concerted EFFORT. And public campaigns have always been the centre of that effort. Even the best-planned policies need to be marketed at targeted publics for effective and efficient implementation. The planned and sustained effort to establish and maintain goodwill and mutual understanding between government and its public is a key to success. Social Marketing is the application of proven concepts and techniques drawn from the commercial sector to promote changes in diverse socially important behaviors. TODAY WORLD – Facebook, Twitter and Instagram. Marketing Complexity – what should be remembered is this: the right answers on how to design a successful information effort to promote a product or politician or policy are more likely to come when the right questions are asked. Questions, questions, questions! Questions should be asked because they throw up alternatives. Basskaran first worked as a journalist, followed by more than 30 years in shareholder communication, public relations counsel and marketing communications in various sectors. Before his private sector engagements, he managed the Singapore Government’s national social campaign projects. He introduced innovative, emotive concepts like national icons such as Singa for the National Courtesy and Teamy for Productivity Campaigns (1980), and Stand Up for Singapore (1984) national songs for national anniversary events. When he was Head of Government’s Press department, he was actively involved in crisis management such as Laju Hijacking, involving terrorists in Singapore and the Vietnamese Boat People, refugees during the Vietnam War. Mr. Nair wrote A Primer on Public Relations in Singapore (1986) and authored a series of books on Social Media entitled “From Main Street to Cyber Street: Changes in the Practice of Communications”.